A couple of days ago I fished above Cedar Grove in Kings Canyon. Caught forty-seven trout in the South Fork of the Kings River. I caught about eight trout in the morning and the rest in the afternoon. It is just now becoming fishable as the snow melt is slowing. Fishing should be good for the next month or two on the Kings River. I have been home since the July 4th weekend. In the last ten days I have fished three different golden trout creeks (and other rainbow creeks) within fifty miles of my house. It takes two to three hours to slowly drive the paved winding roads up to eight thousand feet of elevation. 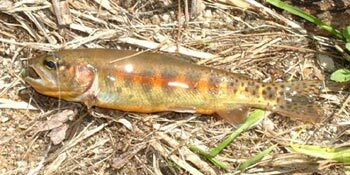 I can walk from the car to the creeks in less than five minutes and be into golden trout or hybrid golden-rainbow trout. I caught seventy-five trout in about four hours on one of the forks of the Kaweah River by Mineral King. All trout are caught on a three-weight rod using dry flies. It is great fun. These creeks are in areas that are steep so that I can't recommend them to those who have bad legs or hearts. I fished one creek that was in a relatively flat meadow with a gentle, wheel chair access, paved trail at high altitude that might be doable for those less mobile. I am still looking for a place that is an easy walk. Generally the trout at this altitude are small guys. You can step across many of the golden trout creeks without getting your feet wet. One of the bigger creeks was six feet wide. It is challenging to cast to a little creek that is only two feet wide, and has sharp banks with tall grass or bushes hanging over. You either cast onto the water or hang up on the vegetation. A little puff of breeze and your cast is into the grass and not on the water. I am going to contact the fellow at DFG who is in charge of golden trout creeks in the Sierras to see what other creeks are close to the road and fishable. Last week I had dinner with the DFG guy who is responsible for all the lakes in the Sierras. He is the guy who decides if the yellow leg frog or trout will live in each of the 2,500 lakes. I figure he must know which lakes have big and hungry trout. He also fly fishes. I don't like his frog decisions very much, though. I think the trout should eat the frogs, then DFG can plant more trout.